AIO Liquid CPU coolers or CPU Water Coolers are the preferred choice for high end CPUs, high-end gaming PCs and for high overclocking. On the other hand, CPU Air Coolers are more suited for mainstream gaming PCs and for average or moderate overclocking. 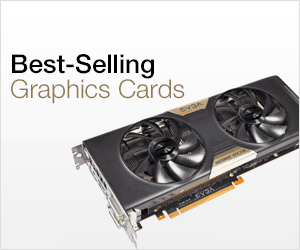 Custom Liquid CPU coolers or AIO CPU Coolers offers significant greater performance over CPU Air Coolers most of the times. However, there are some high-performance CPU Air coolers available that can be as good as CPU liquid coolers and in some cases, may suppress them in some tests. These high-performance CPU Air Coolers come with dual heatsinks and dual fans, and they are also known as twin tower CPU coolers. 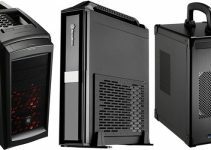 These twin-tower or dual tower CPU Air coolers are much bigger in size and requires a bigger PC case and bigger motherboard to fit in comfortably. These high-performance CPU Air Coolers can be compared to a good AIO Liquid CPU Cooler having 240mm Radiator. Twin-tower CPU coolers are heavy and bulky because of their bigger size and they do require a strong support from the motherboard and computer case. I suggest to use these twin tower CPU coolers with ATX sized or bigger form factor motherboards and Full Tower cases. They can be too big for most of the mid-tower computer cases but some of them may accommodate them if they have more space to offer. I have seen that some of the enthusiasts or users do not prefer AIO CPU coolers or custom liquid CPU coolers because they may require maintenance with time and they eats up extra spaces for case fans because of their radiators, and if the liquid somehow leaks then it can cause serious damage to your motherboard, graphics card and other components. Also, the pump can becomes noisy with time and its failure may result in damage to your CPU because of overheating. So, here I am going to list down the best CPU Air Coolers that you can buy for your high-end gaming rig and for overclocking. Here are the best CPU Air coolers with twin tower heatsinks from top brands. These dual tower CPU coolers deliver exceptional cooling performance even during overclocking, and can serve as a replacement for Liquid CPU Coolers having Dual Radiators. I have to say that Noctua NH-D15 is unarguably the best CPU Air Cooler that your money can buy. 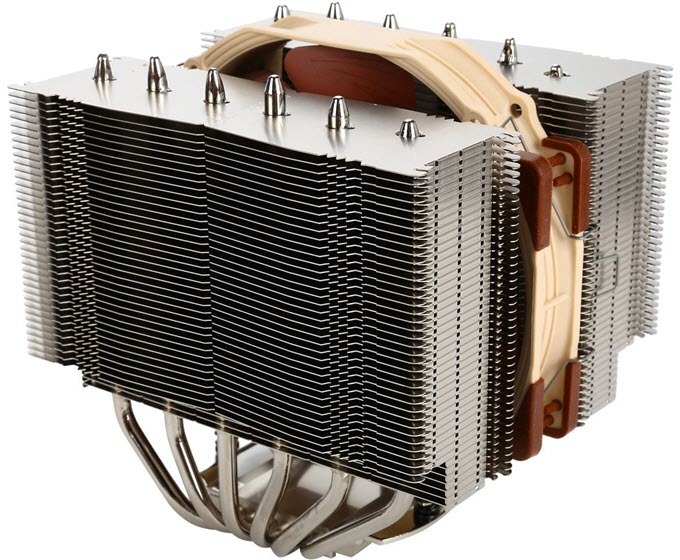 This is the improved version of the older Noctua NH-D14 CPU Cooler. This is a beefy CPU cooler that comes with dual tower heatsinks and two Noctua NF-A15 PWM 140mm fans. It has got six heatpipes that are shared between the two heatsink towers and have contact with the CPU base. The fan comes with 120mm mounting holes and if you have memory with taller heatsinks then this cooler can also operate with a single fan which is placed in the middle of the two towers. Along with one RAM slot this cooler may block your first PCIe slot too. Noctua NH-D15 supports CPUs up 165+ TDP and variety of Intel and AMD CPU Sockets. You can overclock your processors quite a bit on this monstrous CPU Air cooler. It comes with NT-H1 thermal compound and Low Noise Adapter that can reduce the fan speed to 1200 RPM for even quieter operation. This CPU Air cooler can easily beat most of the AIO liquid CPU Coolers with 240mm Radiators such as Corsair H100i v2. The cooler remains pretty quiet during operation due to its high quality silent fans. The CPU cooler is also very easy to install. So, if you are an enthusiast and looking for a high performance silent CPU Air Cooler for gaming and overclocking then don’t think twice and get this one for sure. Highly Recommended by me. 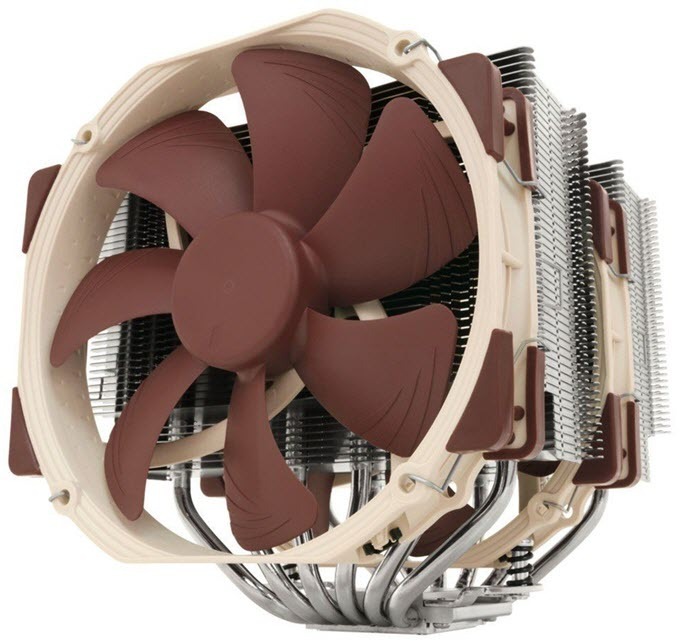 Noctua NH-D15S is a single fan version of the above mentioned Noctua NH-D15 CPU Cooler. It features an asymmetrical design for better RAM clearance and also freeing up first PCIe slot. It still has dual tower heatsinks and comes with a silent 140mm fan in the middle. You may optionally add another 120mm/140mm fan for better cooling but then it will provide less clearance for RAM. In its normal mode i.e. with single fan, it offers 65mm clearance for tall and high-profile RAM. The performance difference between this S version and the normal NH-D15S variant is very minimal (1-2 degrees or so). The CPU cooler comes with 6 copper heatpipes and is also very silent in operation. The installation is quite simple and it support most of the Intel and AMD CPU Sockets. So, if you don’t want to take any chances with clearance and compatibility (RAM, Motherboard, Case) and want the same performance of the award winning NH-D15 CPU cooler then you must definitely go for it. Highly Recommended by me. be quiet! Dark Rock Pro 4 is the successor of the be quiet! Dark Rock Pro 3 CPU Air Cooler which was also one of the best high-end CPU Air Cooler around. This CPU Cooler is very close to the cooling performance of the above mentioned Noctua NH-D15 CPU Cooler. It may run a couple of degrees hotter than Noctua NH-D15 but is quieter than it. In fact, this is the most silent high-end CPU Air Cooler with dual fans and dual tower heatsinks. It come with two fans having different sizes, one is Silent Wings 3 120mm PWM fan and the other is Silent Wings 135mm PWM fan. The 120mm fan is static pressure fan and it located at the front of the CPU cooler while 135mm fan sits in the middle and works as a dual-purpose fan. You may add another 120mm fan at the other end side if you want to increase cooling performance to even better. It comes with seven 6mm copper heatpies and the complete heatsink is coated with special black coating with ceramic particles for better heat transfer. Also, it has airflow-optimized, wave-contoured cooling fins with small dots on their surfaces for increasing the air circulation and thus achieving better cooling performance. The seven 6mm heatpipes are shared by the two heatsink towers. Also, the dual tower heatsinks are connected by an aluminum plate or cover on the top that gives it more rigidity and an elegance touch. This black beast is also very easy to install and I suggest you to install it before putting your motherboard in the computer case. 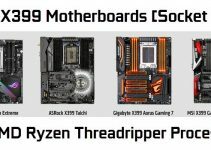 It supports majority of the popular Intel and AMD sockets but sadly misses out on AM4 socket. This CPU Air Cooler is suitable for high-end Core processors (Core i7) and you can do moderate to high amount of overclocking on it. 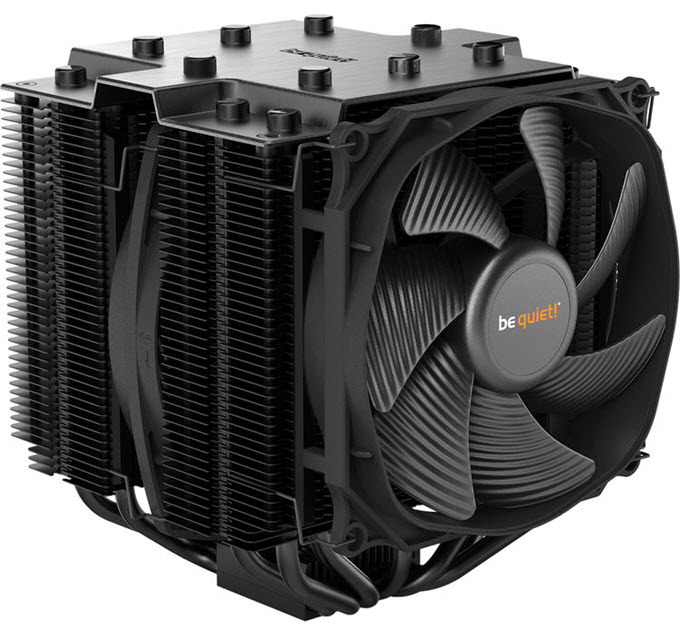 Overall, a great high-end CPU Air cooler from be quiet! that lives up to its expectations and is super silent in operation. A powerful CPU Air Cooler from Cooler Master that has very unique and different design. 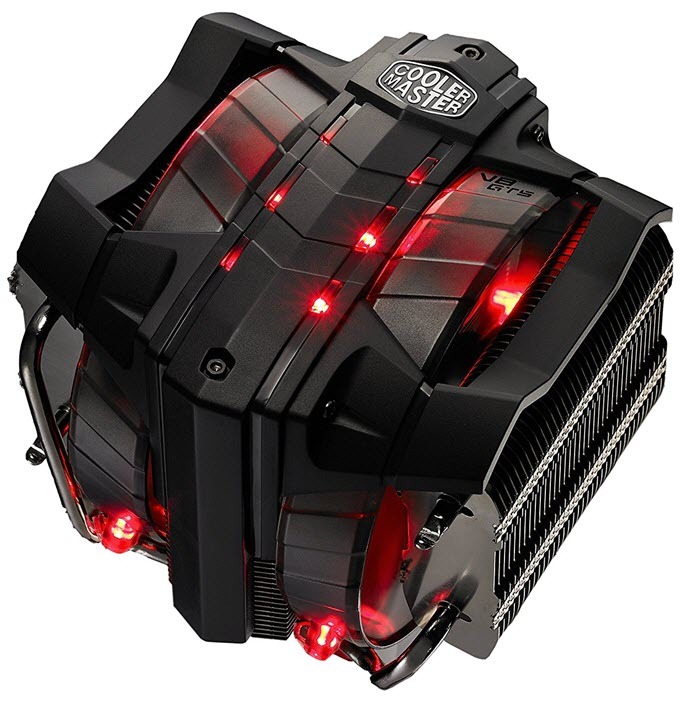 It has Triple Tower Heatsink design and has two 140mm Red LED fans between them. The fan comes with Cooler Master’s 4th Generation Polyoxymethylene (POM) Bearing for increased longevity (up to 160,000 hours) and is advertised as dustproof. The heatsink comes with 8 copper heat pipes, two for each side tower and four for middle tower of the heatsink. It possesses Cooler Master Horizontal Vapor Chamber Technology that minimizes CPU hotspots and spreads heat evenly to all heatpipes. Even with three towers, the cooler is pretty compact and allows very good clearance for RAM with taller heat spreaders or heatsinks. 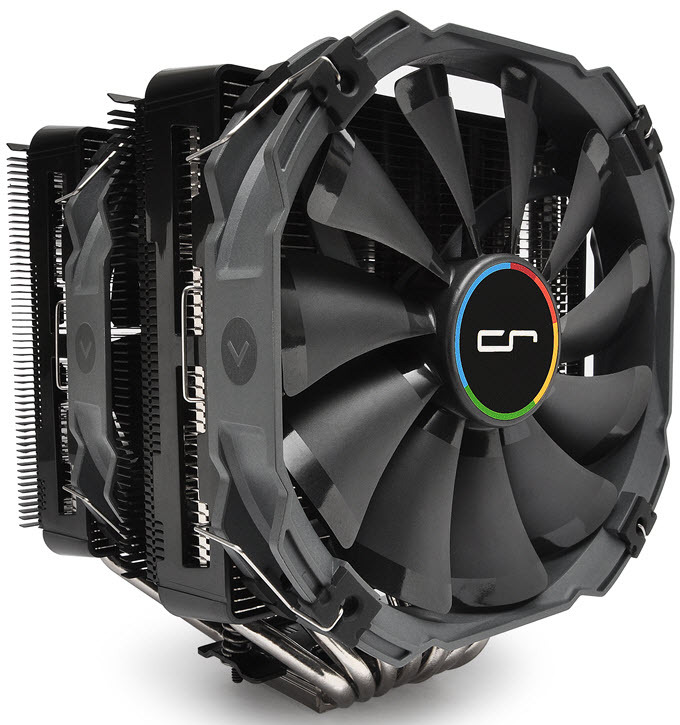 The CPU cooler looks like a robot or a transformer’s face with its modern and futuristic design, and this sets it apart from other regular twin tower CPU coolers. To me this is the best looking high-performance CPU Air cooler in the market right now. The cooling performance of this CPU Cooler is comparable to that of Noctua NH-D15 and be quiet! Dark Rock Pro 4 CPU Coolers. This CPU Cooler performs best at higher loads and overclocking. However, the cooler is on the noisier side, so it is not for users wanting a silent performer. It is compatible with majority of Intel and AMD sockets but its installation is a bit of hassle. It can support processors up to 250W TDP and you can perform decent amount of overclocking on it. This is a CPU Cooler that is more suited for gamers because of its stunning looks and somewhat noisy performance which might not be a major issue for gamers. Phanteks PH-TC14PE is a high performance CPU Air cooler that looks similar to Noctua NH-D14 CPU Cooler but performs better and is cheaper too. This is a twin tower CPU cooler that comes with two 140mm PH-F140 Premium Fans and thicker 8mm five Copper heatpipes. The cooler is on a bit on taller side at 171mm. It has great build quality and it uses P.A.T.S (Physical Antioxidant Thermal Spraying) and C.P.S.C (Cold Plasma Spraying Coating) Technologies to deliver superior heat dissipation and heat transfer. The performance of this CPU cooler is in the league of top-end CPU Air coolers like Noctua NH-D15, be quiet! Dark Rock Pro 4 etc. It is also pretty silent in operation even at full load. It takes a bit of time to install this CPU cooler but is not that tricky. It is comparatively cheaper than NH-D15, be quiet! Dark Rock Pro 4 and Cooler Master V8 GTS but churns out almost the same cooling performance. The CPU cooling is good for moderate amount of overclocking and is a great alternative to the AIO Liquid CPU coolers. Overall, an affordable and no-nonsense high performance CPU Air cooler that does its job very well. Cryorig is mainly known for its budget CPU Coolers and low profile CPU coolers but here we have a high-end CPU Cooler from it which is Cryorig R1 ULTIMATE. As its name suggests, this is a big and beefy CPU Air Cooler that delivers amazing performance even during overclocking. This dual tower CPU cooler comes with two 140mm fans and 7 heatpipes. Its Patented DirectCompress Soldering increases the actual contact surface between the heatpipe and heatsink fins and has up to 10% more contact surface compared to traditional soldering, that results in more contact surface and faster heat conduction. The fins of the heatsinks are also designed in a special way to better heat dissipation and this is known as Jet Fin Acceleration System by Cryorig. Its total height is 168mm which is not an issue for full tower and super tower cases. This CPU cooler has clearance issue for taller RAM so its better to use low profile RAM with this cooler. 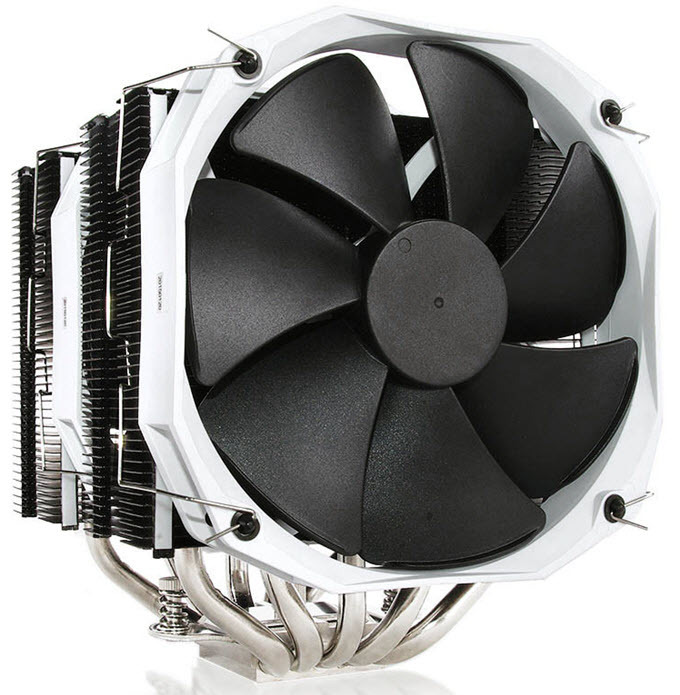 The RAM height limit for this CPU Cooler is 30 – 35 mm. the performance of this CPU cooler is top notch both during normal use and overclocking. It can support high-end CPUs up to 250W TDP effortlessly. It is a bit noisy because its fans are designed for delivering high air pressure. The cooler is relatively easier to install and it comes with all mounting brackets except for AMD AM4. It is a bit on the expensive side but it does not compromise on performance whatsoever. 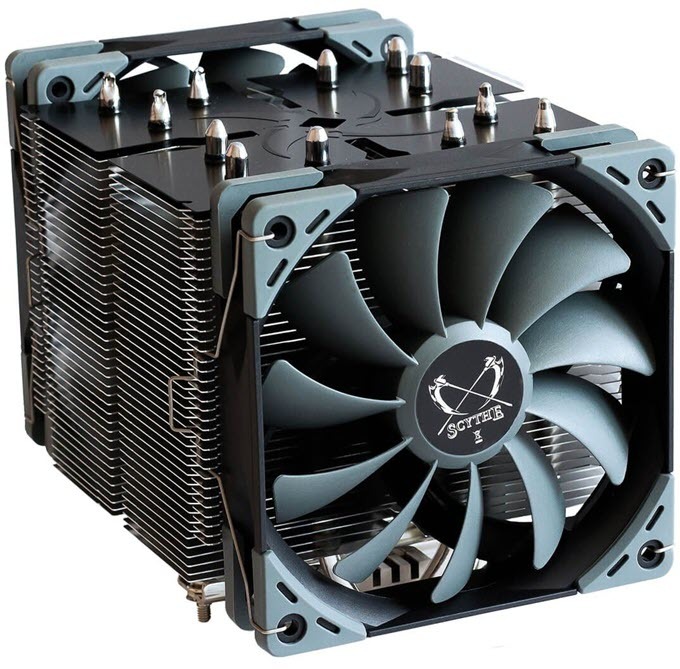 If you are looking for a high-performance CPU Air Cooler that is affordable, super silent, low on height, great on quality and offers great RAM clearance then nothing come close to Scythe Ninja 5 CPU Cooler. This is indeed a big CPU Cooler in terms of depth with large heatsink, but it is relatively low on height at 155mm, and it also offers very generous RAM clearance (up to 55mm tall RAM), due to its special fin design with reduced sides to accommodate taller RAM. The heatsink of this CPU cooler comes with six copper heatpipes and a copper base plate. The cooler comes with dual Kaze Flex 120 PWM fans (with FDB bearing) that have speed of 300 – 800 RPM. The fans are super quiet in operation, with maximum noise level rating of 14dBA only. The two fans are arranged in push-pull setup for better airflow and heat dissipation. The CPU Cooler supports wide range of Intel and AMD Sockets, including AMD AM4 and Intel LGA2011 / 2011-v3 (Square ILM), LGA2066. The installation of this CPU Cooler is very simple, which is done through its H.P.M.S. III (Hyper Precision mounting system). The performance of this CPU Cooler is comparable to that of Noctua NH-D15, which is already a popular high-performance CPU Cooler, and is trusted by many. You can also perform a fair amount of overclocking too on this CPU Cooler, without having to worry about high temperatures. In terms construction quality, this CPU Cooler really stands out as it has great fit and finish, and does look very premium in black. So, if you are looking for a high-performance budget CPU Cooler with wide compatibility, and is super silent in operation then look no further. Highly Recommended by me. 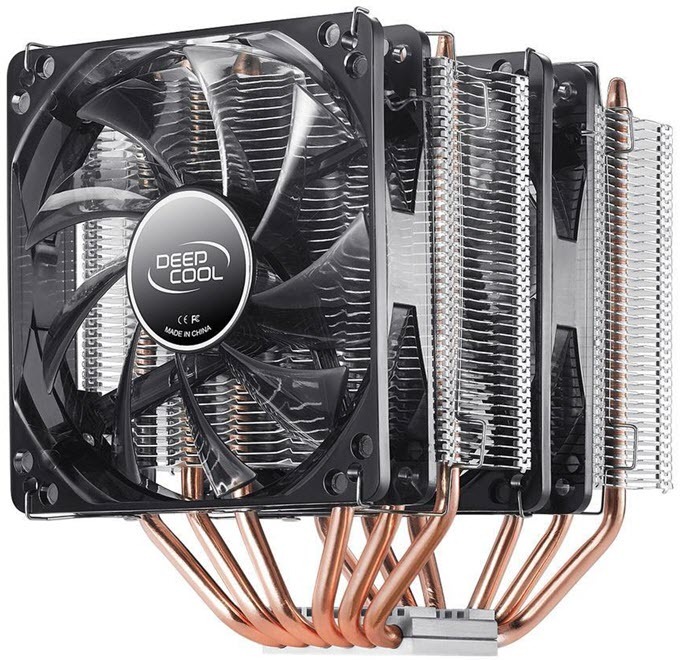 Deepcool NEPTWIN V2 is the cheapest twin tower CPU cooler that you can buy for your high-end CPU. This budget dual tower CPU cooler comes with two 120mm Blue LED fans and 6 copper heatpipes for better heat dissipation to the surroundings. It is a great budget CPU cooler for running high-end processors such as Core i7, Ryzen 5 / 7 and you may be able to perform a bit of overclocking too. This cooler offers less cooling performance compared to the above mentioned coolers but it costs almost half of them and offers great value for your money. 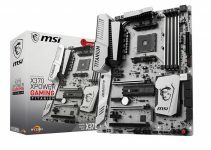 It is compatible with wide range of Intel and AMD CPU Sockets including AMD AM4 Socket. It may be a little hard to install but once done, you have nothing to worry about. It offers good amount of clearance for RAM even with taller heat spreaders. The cooler is not that tall (159mm) and can easily fit in a decent mid-tower case. It can support Intel CPUs up to 150W TDP and AMD CPUs up to 140W TDP. So, if you are looking for a budget twin tower CPU cooler with good performance then you won’t find anything better than this. Highly Recommended for users on budget. So, if you prefer using a CPU Air cooler than an AIO Liquid cooler for your high-end gaming rig then these above mentioned high-performance CPU Air Coolers will not let you down. They are almost maintenance free and provides equal or a bit better performance over the AIO Liquid Cooler with huge Radiators. If you have any doubts regarding the compatibility, performance and specifications of these high-end CPU Air Coolers then do ask me by leaving a comment below.